I had a class of 4th graders today who were feeling their oats a little. They just couldn’t quite get it together to be quiet, follow directions, not talk back, not roll their eyes and make faces at me. They weren’t tearing the walls down or anything, they were just pushing the limits with me. And all I wanted them to do was decorate their library cards and use shelf markers. So I made good on a threat I have made to all my classes: behave and follow directions, or I will read to you from the dictionary. It’s not a hard choice. Listening, doing what I say, and following directions means we can have scavenger hunts, play some games, learn how to do some cool things on the computers, check out books. That’s a good year. Misbehaving means sitting in total silence while I read out loud from the dictionary. Or the phonebook if I have to. It’s a no-brainer. 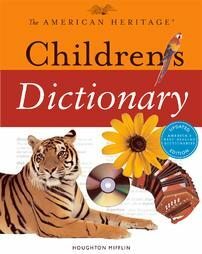 I used this American Heritage Children’s Dictionary so I could even describe some of the pictures. I got all the way up to “accord” and marked the page so they’d know I’d be ready next week if necessary. But I think they got the idea.